Ramblings of a multi-tasker: Crying makes me look like a frog! Crying makes me look like a frog! The last few months I have cried enough tears to make my own lake and crying is far more complex than I initially realised. Humans can cry three kinds of tears. Reflex tears are those that keep our eyes lubricated, basal tears are the annoying ones caused by irritants like onions and emotional tears are, as you’ve probably guessed, caused by emotional triggers. Only humans are reported to cry emotional tears. Though animals can howl in distress, as humans we are the only animals that actually shed tears of sorrow. Each type of tear contains a different composition of hormones and proteins. According to some clever, scientific folk, emotional tears contain higher levels of manganese and the hormone prolactin. The release of these chemicals when you cry, is said to keep depression at bay and calm us and may be the reason a good cry can sometimes make you feel better. It’s true that a good old crying session can make things feel like they’re ok again but cry after cry after cry just makes me feel worn out and ugly to be honest. It’s quite shocking what these prolonged crying sessions can do for your looks. I actually looked like a cartoon frog a couple of weekends ago because my eyelids were so swollen from way too many tears. This rather attractive condition is known as periorbital puffiness and is just water retention caused by the sodium in your tears. Logical, yes but definitely not attractive. It took a good couple of days for the swelling to subside. I’m not usually such a crier but 2011 has been tough. I don’t want any sympathy but feel I owe it to a few people to explain some of the things that have been happening over the last few months. My normally chirpy tweets have been sad of late and I haven’t really been myself. I really appreciate the messages of concern that I have had and the support from those around me. I am also fully aware that there are people with problems far worse than mine out there and I am not crawling for sympathy. I am an honest person and just like to explain myself. Back in January on the first day back to work after the long Christmas break, I bumped into my Dad whilst out on a morning run. It was a surprise meeting and neither of us expected to see one another. I had just started my Team Bangs training and was raring to go but I had that horrible back to school, Sunday night fear feeling, multiplied by a million. I could have done without Dad blurting out that Mum thought he was having an affair. To cut a long story short there were lots of tears and it materialised that Dad had a new lady friend that he had been going for coffee with. It was purely a platonic relationship apparently. He insisted this was the case on numerous occasions. Nobody but my parents and myself knew of this little hiccup and I played mini marriage counsellor for a few months. I have to say, it’s really strange seeing your parents in a different light. It can almost be compared to when you have a house party when your parents are away and the house is at its most vulnerable. You never quite see it in the same light and it always feels a little different. Parents are only human but you look up to them. It was strange being in the middle of these intimate conversations, seeing them both upset and vulnerable and trying to advise them both of stuff I have no place to be advising them on. I’ve never been married and couldn’t even begin to imagine how they were feeling but all I knew is that they loved each other. Mum and Dad decided not to tell my brother and sister so by default I had to tell a few fibs to keep it from them. For me this was a real challenge as I am a rubbish liar. My mum is amazing and the reason she asked me not to say anything was because she didn’t want my siblings to think badly of my Dad. A few things I ought to explain to put this blog post in to context. My family are very normal (whatever that means) and very close. 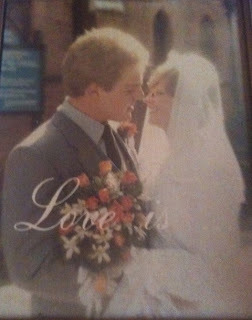 Mum and Dad have been together for over 35 years and as far as everybody that knows us is concerned, we are very much the happy family with no dramas. This is Mum and Dad on their wedding day and I love this picture. When they met Mum was 15 and by the time she was 19 they were married. A true love story! Fast forward a few months and it becomes clear that Dad and his friend are still talking although my mum has expressed, understandably, that she doesn’t want him to have contact with her if they are to concentrate on making their marriage work. Mum and Dad still continue to work at it and I keep running, training for my half marathon in Paris. Not all of 2011 has been bad and training with the Team Bangs ladies definitely kept me sane for a few months. In March my four year old niece (daughter of my sister) was rushed into hospital with severe asthma and a shadow on her lung. Seeing her wired up to medication and oxygen was shocking. Just as we thought she was improving and she was sent home she had another attack, turned blue and we had to call an ambulance for her. This went on for 8 weeks, back and forth to A&E with no answers to what was causing her condition. It was so stressful. Meanwhile my Dad’s birthday and Mother’s Day happened and my siblings and I paid for our parents to go away on holiday. I was desperate for them to spend quality time together without the stresses of home but it wasn’t meant to be and as they were driving to the airport my niece had another attack meaning that they turned round to be there for my sister and their granddaughter. We are a close family and going away at a time like that was simply out of the question. Mum and Dad’s problems went on the backburner. After a lot of effort from my Mum and sister they managed to get my niece an appointment at the Brompton hospital and luckily she had an attack whilst waiting to be seen. They kept her in and weren’t going to let her leave until they knew exactly what the cause of her illness was. Finally, after a few hours in theatre we discovered she had a severe chest infection but I’m pleased to say she is now back in good health. Well, nothing that a puff or two on her inhalers won’t sort out. Mum and Dad re-booked their holiday and ended up going away at the same time Jon and I headed to Croatia. We had an amazing holiday and flew back the day after our five year anniversary on 9th May. Jon was amazing and booked a surprise stay in a gorgeous luxury hotel to celebrate. We had a fantastic time away. On the way back from the airport, faces smiling, we pop in to see my parents. You could have cut the atmosphere with a knife and I knew things weren’t going right. This frostiness carried on for weeks. It all hit the fan again just before we were due to attend a family wedding at the end of May. Perfect timing! This time round my parents told my brother and sister and I was able to be honest with them. I hated lying and I felt relieved. In a strange way it brought us closer together and we talked a lot. We all shed happy tears in church when the vows were being exchanged but I knew in my case that there was sadness in those tears too. I knew in my heart that the words being exchanged between the bride and groom were somehow no longer relevant for my Mum and Dad. I looked at my Dad and he looked sad and I couldn’t even bring myself to look at my Mum. We carried on playing happy families because nobody wanted to ruin the big day and although I was pushing the thoughts aside, I knew it was only a matter of time before Mum and Dad were going to go their separate ways. It’s funny how testing times put things into perspective. Two weeks ago my four year old niece came up with a little rash. She was taken to hospital on the Sunday night with suspected meningitis and was kept in. Three days later she was moved to the Royal Marsden, a cancer specialist hospital, with suspected leukaemia. The feeling to be told something like that is so hard to describe and although I was trying not to think the worst I just couldn’t help it. I felt so helpless and useless. I am very much a doer and a positive person but I just couldn’t pull myself together. I was an absolute wreck. It made all of the other things that I usually worry about seem so trivial. On Thursday evening, after her bone marrow biopsy, we were told that although she is very poorly, she did not have cancerous cells in her bone marrow which meant she didn’t have leukaemia. The relief was unbelievable. It actually felt like a weight had been lifted. She is still very unwell and we are awaiting test results to see how they are going to treat her as her bone marrow has stopped working. Seeing her in that hospital made me realise even more just how precious life is. The ward that she was in was full of very sick children that had no choice about what was happening to them. It was heart breaking to see and very humbling at the same time. Last week Dad left home. Although he was there for the family when my niece was in hospital, my Mum knew that he wasn’t really there for her. She built up the courage and told him to leave and so he left, just like that. We are now like all of the other kids were at school but because we are grown up we don’t get weekend trips to the zoo. Dad is now living with his platonic friend who is clearly not platonic. She has left her partner too. If only he could have been honest from the start we could have dealt with this differently. Instead, all of us have been clutching on to a glimmer of hope. I know this happens all the time but I can’t quite believe it has happened to my family. The normal happy family that others look to as being a real strong unit that sticks together. We are still sticking together and trying to be strong for my niece and my brother’s family but the next few months are not going to be easy. Be grateful for everything that you have and be true and honest to yourself and to those around you that you love. We all make mistakes, I know that. We are only human but at least try and learn from the mistakes and think about other people along the way too. There have been a few other hiccups the last couple of months that have contributed to Lake Teardrop such as £130 parking tickets, a 999 call and a few other things that don’t really matter. I seem to have the opposite of the midas touch at present. You’ll be relieved to know that I’m not going to bore you any further with my tales of woe but when the good things come along, make sure you grab them with both hands and smile because looking like an amphibious, bouncing, croaky creature is not a good look in any season! I’m going to get new trainers tomorrow and crack on with my running again. I just haven’t really had the energy the last few months with all of the tears. As well as emptying your body of depression causing chemicals and hormones, crying zaps your energy too but enough with the excuses. Tuesday will be my debut at Run Dem Crew. Yes I am scared! I am no East London chick but life is there to be lived and it is important to challenge yourself even if it is a little scary at times. There is nothing stopping me apart from a few little nerves and I am going to kick them aside to get me ready for my second half marathon in September. Nothing is going to get in my way, not even a huge lake of tears or a frog with bulging eyes. Oh love I'm sorry. My parents divorced in my teens and kept it from my little brother as long as possible. Horrible horrible time. It's awful feeling like the parent in the relationship. Much love from me as well. You've written this story so so well, it's just sad it's a negative one. But that is life. I have been through a lot too this year and don't really know how much more I can take. But y'know, the strange thing is: after a while you sort of get used to it (the negative stuff) and just desl with it. You get stronger. It's not just a myth. Exercise is what gets me through most days. It really does help to lift mood, to sort of revitalise... Friends help. Talking, crying(and laughing) with them. And then writing helps. I'm sure you feel better after writing this post. Stay strong :-) It will be okay. Everything will be okay. Somehow.